In this fast paced world we live in, a quick and effective fix is what everyone yearns for, including the looks department. While majority of the population has now been more accepting of cosmetic procedures, the tolerance for long downtime has somehow dwindled. Now, what everyone wants to talk about is how soon can they proceed with their daily activities after the treatments, and how effective the procedure is in general. In addition to the time and efficacy factor, there is also the costing consideration. Everyone wants to look good, but the economy is not always in our side, so while all of us would want to achieve the best result possible, we also have to take into account our budget. WHAT IS HIFU IN THAILAND? HIFU or High Intensity Focused Ultrasound is a device that delivers high frequency sound waves (Ultrasound) to the deeper layers of the skin up to the underlying muscles to lift not just the skin but the underlying tissues as well. Minimal but immediate lifting can be expected after treatment with the result culminating over a period of 2 weeks, and staying for up to 2 years. HIFU, like Ulthera, use different sensors for different target depths, therefore, it can also be used for treating under eye bags and wrinkles, face contouring and lifting, skin tightening, ptosis correction, and generally, for anti-aging skin rejuvenation. WHAT ARE THE BENEFITS OF HIFU IN THAILAND? Aside from the obvious no-downtime, no-incision, non-surgical benefits of HIFU in Thailand, the treatment is also very budget-friendly. The whole procedure will take 60-90minutes so it can be done on a lunch-break whim. The treatments will require no anesthesia (but our center can apply topical lidocaine per request), and while the application can be uncomfortable, the pain is usually just intense on bony areas and not much on fleshy parts. Redness and swelling are very minor if any, and you can be guaranteed to go back to work or go on with your shopping plans immediately after the procedure. ARE YOU A GOOD CANDIDATE FOR HIFU IN THAILAND? Like all non-invasive-non-surgical treatments, HIFU in Thailand has limitations in terms of result. While it can effectively lift sagging skin and improve wrinkles, it will only do so much for excess skin which usually warrants surgery. HIFU is most effective for browlifting, midface lifting, nasolabial fold improvement, neck and under chin lifting, jowl lifting, and general skin tightening. Patients over 30 who are looking to have a little lift are therefore ideal candidates for this treatment. 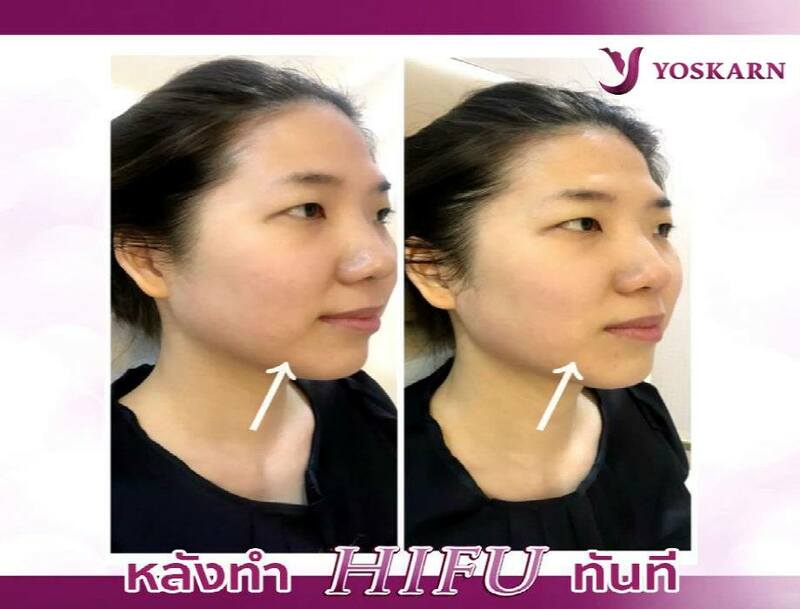 WHY CHOOSE YOSKARN CLINIC FOR HIFU IN THAILAND? At Yoskarn Clinic, we offer non-invasive (Ulthera and HIFU), minimal invasive (Thermitight, Botox, Threadlift), and invasive (surgery) procedures so you can rest assured that whatever our surgeon recommends for you, it is based on thorough assessment and not just availability. Prof. Kunachak, along with our team of surgeons, take time to evaluate your problem areas, listen to your desired result, consider your time frame, and give the best recommendation possible to suit your needs. Aside from the experience and versatility of our doctors, our center is also located right at the center of Bangkok so if you are just on a 2 days trip shopping escape, or you are on a tight business schedule, or touring with your kids, family, and friends, what better way to do a quick little lifting than to drop by at Yoskarn Clinic, right at the heart of the city. Since we also offer a one-stop cosmetic service center, you may be able to do more than just lifting is you want to as we also offer CoolSculpting (non-surgical fat reduction), Chelation therapy, laser treatments, and many other procedures to ensure you will come out looking fresher and younger than when you came in.